As more people populated Seattle and its neighboring communities on the east side of Lake Washington, it became apparent that ferries couldn't adequately serve as the shortest east-west trans-lake link. And to go around the lake the trip could be as much as 25 miles, the lake's north-to-south distance. The obvious solution: a bridge. But what kind of bridge? Many suggestions surfaced but one in particular excited people's imagination. 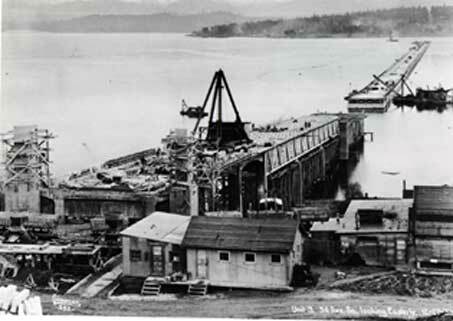 In 1920, Homer Hadley, a young engineer working in the architectural office of the Seattle School District, suggested a floating bridge supported by concrete pontoons. 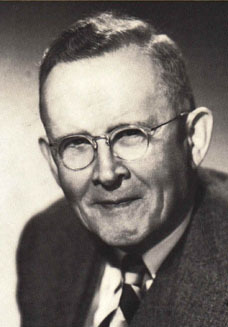 Mr. Hadley drew upon his experiences building concrete ships and barges in Philadelphia during World War One for the Emergency Fleet Corporation. He formally proposed his idea at a meeting of the American Society of Civil Engineers on October 1, 1921. Mr. Hadley's proposal caused considerable debate. The skeptics included the Seattle Times, Seattle civic leaders, and the Lake Washington Protective Association. Then around 1925 the Mercer Island Community Club (MICC) became involved. On the Island, community clubs were forums for the residents, getting involved in such Island happenings as ferry service to Seattle, potential health hazards, sanitation control, and the water supply. The MICC began work on gaining a bridge across Lake Washington to Seattle. George Lightfoot (1889-1941), an early East Seattle resident and postmaster, led the fight for over 15 years. Until 1930, the bridge was projected as a private enterprise, but the crash of '29 ended that effort. Club members turned to Washington State, working five years in Olympia to gain the necessary funding. The funds became available in 1937 for building the bridge (which would turn out to be the largest single road project in the State's history up to that time), and the Washington Legislature created the State Toll Bridge Authority. The time seemed right for Homer Hadley to approach Lacey V. Murrow, director of the State Department of Highways (DOH) with his suggestions. DOH engineers concluded that Hadley’s ideas were practical and adopted his theory. However there were some changes made which included the notorious "bulge" for the draw span so that navigation could take place on the lake. The bridge over the east channel was too low for most major navigation that was needed by Boeing and other shipping traffic. The engineer who did the design was Jacob Samuelson of Seattle, a graduate of an Oslo, Norway technical college. He was also the chief engineer for the general construction of the structure. Funds provided for the entire six-and one half mile project which included the west side approaches, the twin-bore tunnel under Mount Baker Ridge, the floating structure, roadways on Mercer Island and the east side approaches. 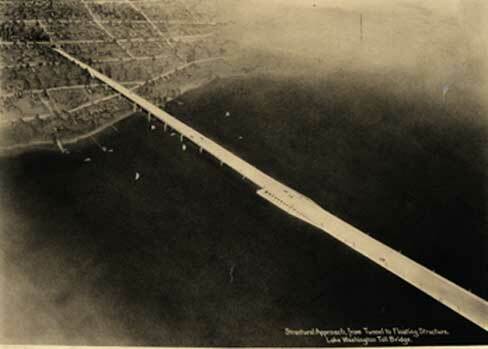 When the Lake Washington Floating Bridge opened it consisted of 25 pontoons made of concrete. This unusual engineering feature spurred the imagination of classical-minded residents who referred to it as the eighth wonder of the world, whether true or not. The bridge proved a boon to eastside communities, spurring a population growth now that Eastsiders could get to Seattle more rapidly, whether for work or for cultural attractions. In honor of George Lightfoot's efforts to procure the Lake Washington Bridge, a plaque was installed in Roanoke Park, dedicated on the occasion of the bridge opening, July 2, 1940. As a note of how George Lightfoot was perceived on the Island--in the 1940 census George Lightfoot's occupation was listed as "bridge promoter". He was able to see the results of his efforts, but passed away less than one year later. Homer Hadley was similarly honored when the 3rd pontoon bridge across Lake Washington was named the Homer M. Hadley Memorial Bridge.